It was out last full day in Vail, and Mr. LH's busiest. He would not be able spend much of it with us since he had several other things he had to attend for the film festival before the closing night party that evening. The "Pickles" had a load of things they wanted to do and we wound up getting to most of them. First things first, we dined on pancakes and french toast at the Westside Cafe again that morning. The Girl wanted to take a picture of her pancake - it's supposed to be a "Micky Mouse pancake" but it didn't come out quite right this time. The restaurant was right there in the hotel, reasonable prices and very tasty so we just became morning "regulars" for the time we were in town. Then we caught the hotel shuttle into town. They wanted to go back to the Pirate Ship Park and the creek (no big surprise there). The daffodils were out in full force in areas facing the sun. and Vanilla (though multi-colored) in a waffle cone for The Boy. We parked ourselves by the creek and watched a St. Bernard fetch sticks from the water. Then we waited (and waited and waited) for the hotel shuttle to pick us up and take us back to the hotel. We were going to meet Mr. LH for a couple hours before he had to get back to work. 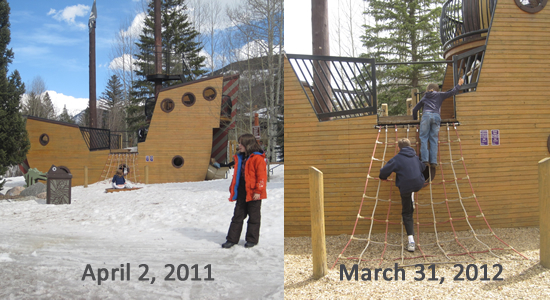 but the difference was more obvious on this last full day in Vail when we went to the top of Vail Mountain. 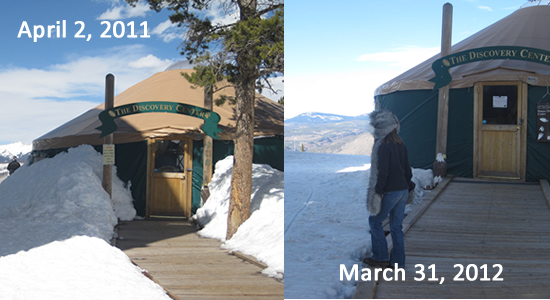 Snow came up to the tops of the walls of The Discovery Center last year. This year, there just wasn't much snow at all. We also noticed that a lot of the "snow" was more like slush. Rather disappointing, but people were still able to ski in it and Adventure Ridge was still open for snow tubing (though for limited hours). When we asked, they said they were only having tubing sessions until 5 o'clock. We were told we could buy a half-hour session (something we didn't realize they offered) so we opted for that. They wound up giving us the remainder of the hour snow-tubing session for the price of 1/2 hour. (1 hour of snow tubing is $30 per person and 1/2 hour is $15 per person). The lift for snow tubing is on the right. Unfortunately, Mr. LH couldn't go tubing with us. He would have to head down the mountain before we were done to attend the film festival's awards ceremony. He did stick around long enough to watch us make our first trip down the hill. The lift to the top of the hill was a long ride and as we got higher and higher, the "Pickles" started to get nervous. I told them it was like sledding - just faster and longer than what they were used to. The Girl and I went together (they would link up no more than 2 tubes at a time) and The Boy went by himself. He was perfectly fine with that - what 12 year old wants to be seen going tubing with his Mom...? The Girl also decided she didn't EVER want to go down by herself. There were multiple lanes at the top so the wait time was VERY short and plenty of staff members at the top of the hill kept everything running smoothly. You just couldn't start down the hill until the previous people in your lane exited the track. I managed to get some video of one ride, though most of it is the very top of The Girl's head (I had to hold the camera AND the tube handles with the same hand and if I let go, I could bounce right out of the tube as we saw one person do). The trip was so fast (about 20 seconds) and so much fun! It is definitely a "must do again" on our list! After our tubing adventure, we headed back down the mountain in the Gondola. Our destination, Moe's Original BBQ. We knew we weren't going to leave Vail without a stop at Moe's. But since Mr. LH wasn't with us, we opted for take-out. A very big order of take-out to chow down on in the hotel and still have some left over for Mr. LH when he got back. Moe's closes at 9pm or when the food runs out (they make the pork BBQ every morning). I was pretty tired at the end of the day, but there was still the film festival's Closing Party being held at The Sebastian hotel. I didn't think the "Pickles" and I would be going, especially since it didn't start until 10pm, but once Mr. LH mentioned it, they were up and ready to go. As it turns out, the closing night party was much louder and more crowded than they had anticipated so they spent their time playing video games in a quieter out-of-the-way spot braving the crowd only once to participate in the making of a "flip book". Then the photos were printed, cut and made into a book (it took about 5 minutes for them to make 4 copies for us). When you flip through the pages, you see the "video" (but they also emailed us the video clip above). The flip book made a great souvenir for the film festival - and it was free! I apologize for the flip book demo being blurry, but you get the idea. While Mr. LH mingled with other film people and the "Pickles" played their games, I wandered the lobby and admired the artwork. There were several pieces like this one made from yarn and wax on wood. and upon closer inspection, discover it was covered in beads! It was late when we finally headed back to the hotel to pack, sleep and be ready to check out the next day. We were all exhausted but we had a great time!